Arkansas Taxable Sales (ATS) rose 0.1% in the first quarter of 2017 — up 2.1% from a year earlier. From the end of the recession in 2009:Q2 through the first quarter of 2017, ATS has expanded at an annual rate of 2.9%. Gasoline prices averaged $2.11 during the first quarter, up from $2.00 in the fourth quarter of 2016. As a result, expenditures on gasoline were up 8.0% in the first quarter and were 27.7% higher than in the first quarter of 2016. Incorporating this source of increased spending, Arkansas Taxable Sales Including Gasoline (ATSIG) increased by 0.5% in the first quarter of 2017, and were 3.3% higher than a year earlier. Arkansas Taxable Sales (ATS) is calculated by the Institute for Economic Advancement to serve as a timely proxy for Arkansas retail sales. The series is derived from sales and use tax data, adjusting for the relative timing of tax collections and underlying sales, changes in tax laws, and seasonal patterns in the data. Arkansas Taxable Sales Including Gasoline (ATSIG) incorporates data on the state motor fuel tax and gasoline prices from the Oil Price Information Service. A spreadsheet of the monthly and quarterly data is available here: Arkansas Taxable Sales 2016:Q4 (Excel file). Arkansas Taxable Sales (ATS) increased 0.4% in the fourth quarter of 2016 (seasonally adjusted), and were up 1.8% from a year earlier. With gasoline prices little changed, an increase in gallons sold pushed gasoline expenditures up 9.9% for the quarter. 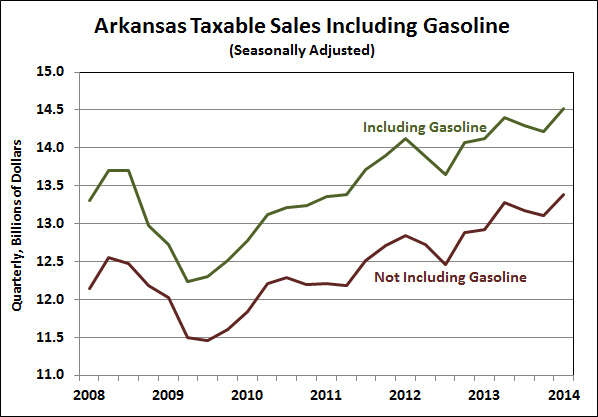 As a result, Arkansas Taxable Sales Including Gasoline (ATSIG) rose 0.9%. Compared to the fourth quarter of 2015, ATSIG was up 2.2%. Both ATS and ATSIG had declined over the first half of 2016, but recovered lost ground in the third and fourth quarters. On average, 2016 was a year of slowing growth in taxable sales. 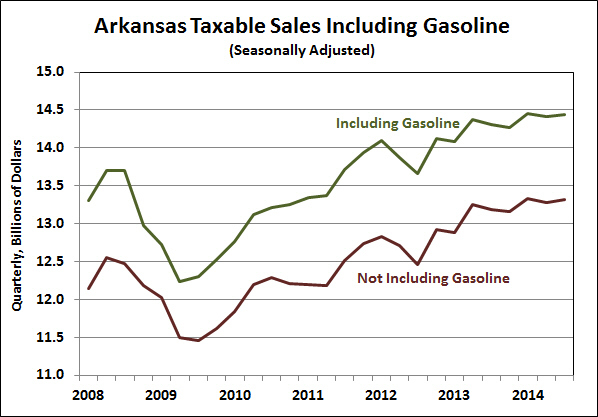 Not including gasoline, Arkansas Taxable Sales were up 1.5% for the year. With gasoline prices down from $2.18 in 2015 to $1.91 in 2016, expenditures on gasoline were down 8.2%. Consequently, ATSIG rose only 1.0% for the year. After declining during the first half of the year, Arkansas Taxable Sales (ATS) rose 2.2% in the third quarter of 2016. On a year-over-year basis, taxable sales were up 1.3% from the third quarter of 2015. Gasoline sales also rose in the third quarter (+1.6%), despite a slight reduction in the average price of gasoline in Arkansas. As a result, Arkansas Taxable Sales Including Gasoline (ATSIG) also rose by 2.2% from the second quarter to the third. Over the past four quarters, ATSIG has increased by 0.6% while gasoline prices have fallen from $2.28/gallon in 2015:Q3 to $1.985 in the most recent quarter. From the trough of the recession (2009:Q2) through the third quarter of 2016, ATS has grown at an average rate of 3.0%. With gasoline expenditures falling at a 2.1% annual rate over the same period, ATSIG has increased at a 2.8% rate. As measured by the price index for personal consumption expenditures, inflation has averaged 1.5% over the 7-year expansion, so that real (inflation adjusted) measures of ATS and ATSIG have grown at rates of 1.5% and 1.3%, respectively. As shown in the final figure below, gasoline prices are at about the same level as at the trough of the recession–around $2/gallon. 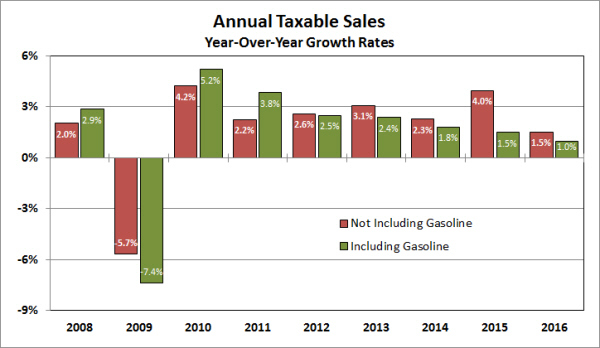 However, spending on gasoline as a percent of total taxable sales has fallen to less than 5%, down from around 6% in 2009. Although expenditures on gasoline have increased over the past 7 years, lower gas prices have allowed for spending on non-fuel items to increase as a share of total expenditures. Arkansas Taxable Sales (ATS) is calculated by the Institute for Economic Advancement to serve as a timely proxy for Arkansas retail sales. The series is derived from sales and use tax data, adjusting for the relative timing of tax collections and underlying sales, changes in tax laws, and seasonal patterns in the data. Arkansas Taxable Sales Including Gasoline (ATSIG) incorporates data on the state motor fuel tax and gasoline prices from the Oil Price Information Service. A spreadsheet of the monthly and quarterly data is available here: Arkansas Taxable Sales 2016:Q1 (Excel file). 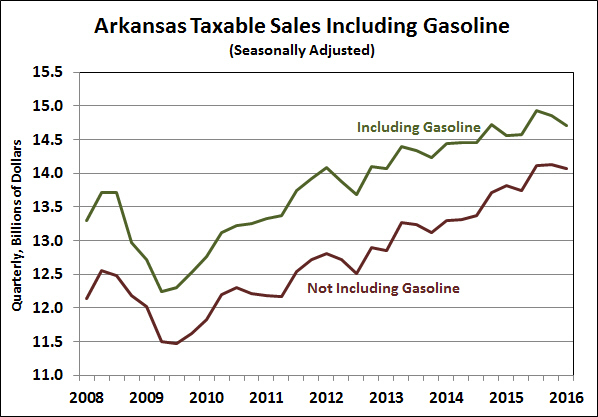 Arkansas Taxable Sales Including Gasoline (ATSIG) declined by 1.0% from 2015:Q4 to 2016:Q1, following a decline of 0.5% in the previous quarter. Compared to a year earlier, ATSIG increased by only 1.0%. Much of the weakness in the growth rate of ATSIG is attributable to low gasoline prices. The average price of gasoline in Arkansas in the first quarter was $1.66, down from $1.94. As a result, spending on gasoline declined by 12.1% (seasonally adjusted). Not all the slow growth in sales can be attributed to low gas prices, however. 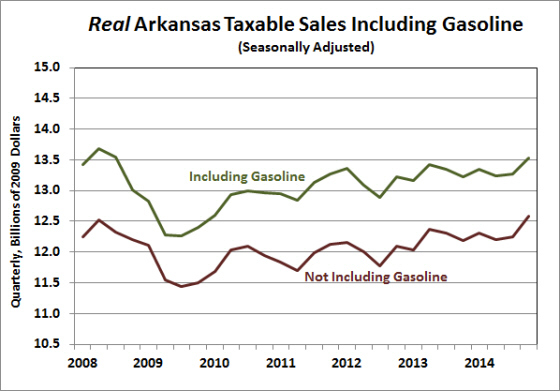 Excluding gasoline, Arkansas Taxable Sales (ATS) declined by 0.5% in the first quarter, following a nearly flat fourth quarter. From 2015:Q1 to 2016:Q1, ATS rose by only 1.8%. After adjusting for inflation (as measured by the price index for personal consumption expenditures), real ATS was up only 0.8% over the four-quarter period. Arkansas Department of Finance and Administration, Oil Price Information Service, Institute for Economic Advancement. Given the state’s low unemployment and relatively healthy income growth, it is surprising that the growth rate of Arkansas Taxable Sales has been so sluggish. Since the trough of the “great recession” in 2009:Q2, ATS has increased at an annual rate of only 3.0%. Over the same period, U.S. Retail Sales have been growing at a 4.4% pace. Although the national figures are not completely comparable to ATS, the discrepancy between the growth rates of consumer spending on the national and state levels is notable. The growing share of internet shopping (which is included in U.S. Retail Sales but not necessarily in ATS) might account for a portion of the discrepancy, but is unlikely explain the difference completely. Sources: Arkansas Department of Finance and Administration, Oil Price Information Service, U.S. Census Bureau, Institute for Economic Advancement. 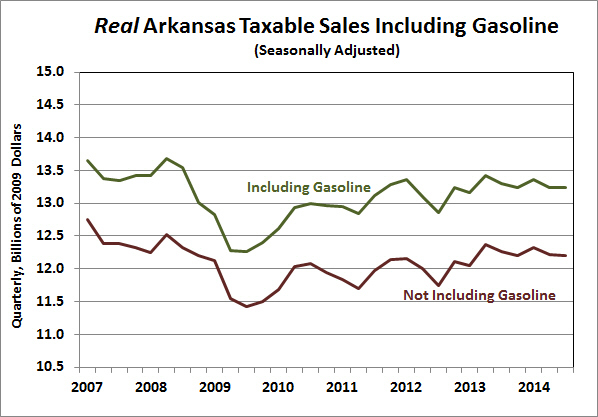 In the first quarter of 2015, Arkansas Taxable Sales Including Gasoline (ATSIG) declined by 1.2%. Compared to the first quarter of 2014, ATSIG was up by only 0.6%. However, much of the decline in overall consumer spending can be attributed to low gasoline prices. Based on data from the Oil Price Information Service, the average price of a gallon of gasoline in Arkansas during the first quarter of the year was only $2.10, down 21.6% from the previous quarter and down 33.9% from a year earlier. Moreover, the number of gallons of gasoline purchased dropped as well: 13.8% lower than a year earlier. Total expenditures on gasoline were down 31.2% for the quarter (seasonally adjusted) and were down 38.7% from the year before. 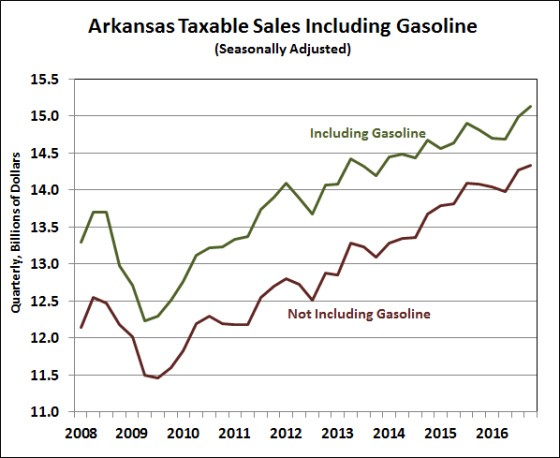 With a smaller share of household budgets going toward purchases of gasoline, the non-gasoline component of Arkansas Taxable Sales (ATS) surged higher — up by 1.0% from the previous quarter and up 3.9% from the previous year. The non-gasoline measure of taxable sales — based on sales tax collection data from the Arkansas Department of Finance and Administration — has increased by 20.4% since the trough of the recession (2009:Q2), reflecting an average annual growth rate of 3.3%. Arkansas Taxable Sales (ATS) is calculated by the Institute for Economic Advancement to serve as a timely proxy for Arkansas retail sales. The series is derived from sales and use tax data, adjusting for the relative timing of tax collections and underlying sales, changes in tax laws, and seasonal patterns in the data. Arkansas Taxable Sales Including Gasoline (ATSIG) incorporates data on the state motor fuel tax and gasoline prices from the Oil Price Information Service. A spreadsheet of the monthly and quarterly data is available here: Arkansas Taxable Sales 2015:Q1 (Excel file). 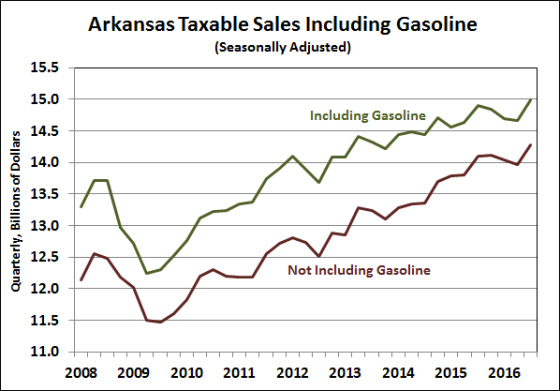 With consumer purchasing power boosted by low gasoline prices, Arkansas Taxable Sales (ATS) surged in the fourth quarter of 2014, increasing by 2.7% from the previous quarter and up 4.5% from a year earlier. With gasoline prices falling by nearly 18% from the third quarter to the fourth quarter, Arkansans were paying quite a bit less to fill their tanks. The dollar-value of gasoline sales fell by 9.1 (seasonally adjusted). 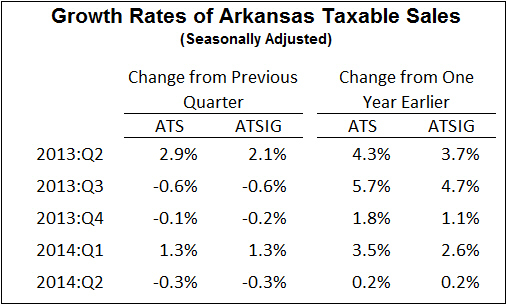 Consequently, Arkansas Taxable Sales Including Gasoline (ATSIG) increased more slowly than the ATS, increasing by 1.8% for the quarter and 3.4% from a year earlier. Since the official end of the recession (2009:Q2), ATS has increased by 19.4% (a 3.3% annual rate) and ATSIG has increased by 20.4% (3.4% annual rate). However, inflation–as measured by the price index for Personal Consumption Expenditures–has been associated with an increase in prices of about 9.4% over the same period. Consequently, real taxable sales have only been increasing at an annual rate of 1.6% (not including gasoline) and by 1.8% (including gasoline). After this adjustment for the effects of inflation, real taxable sales are only now recovering to levels comparable to the pre-recession cyclical peak of 2008:Q2. Arkansas Taxable Sales (ATS) is calculated by the Institute for Economic Advancement to serve as a timely proxy for Arkansas retail sales. The series is derived from sales and use tax data, adjusting for the relative timing of tax collections and underlying sales, changes in tax laws, and seasonal patterns in the data. Arkansas Taxable Sales Including Gasoline (ATSIG) incorporates data on the state motor fuel tax and gasoline prices from the Oil Price Information Service. 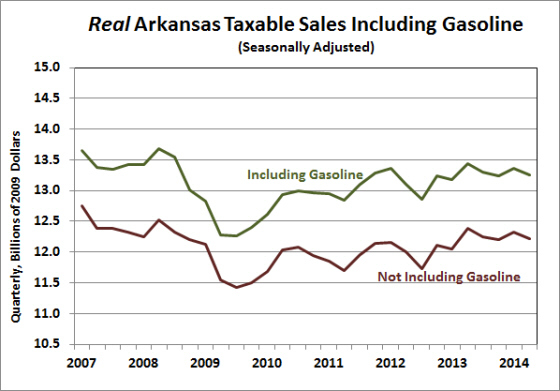 A spreadsheet of the monthly and quarterly data is available here: Arkansas Taxable Sales 2014:Q4 (Excel file). Note: With this release, seasonal factors for the monthly data have been revised. 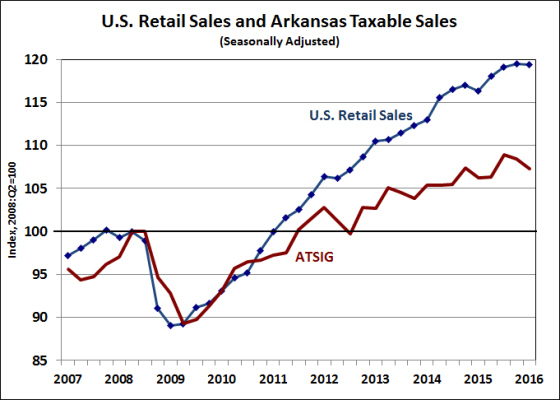 A proxy for state retail spending, Arkansas Taxable Sales (ATS), increased by 0.2% in the third quarter of 2013 (seasonally adjusted). Compared to the previous year, ATS was up 1.0%. 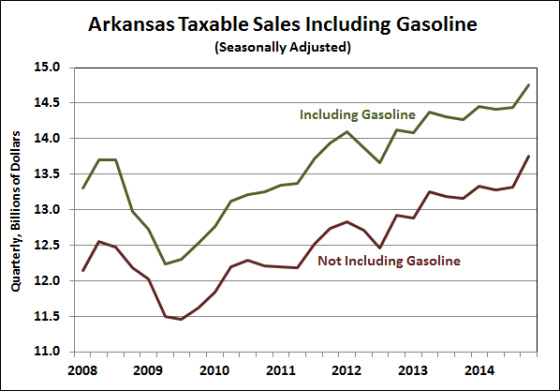 Arkansas Taxable Sales Including Gasoline (ATSIG) also rose by 0.2% for the quarter and was up 0.9% compared the third quarter of 2013. The slightly slower year-over-year growth rate for ATSIG reflects the effect of lower gasoline prices on total household spending. Since the trough of the recession, ATS has increased by 15.8% — an average annual percentage rate of 2.8%. Meanwhile, ATSIG increased by 18.0% — or 3.2% annually. Over the past four quarters, the price index for personal consumption expenditures has increased by about 1.5%. Accordingly, the 1.0% (0.9%) rate of increase in ATS (ATSIG) translates to negative growth after adjusting for inflation. As shown in the figure below, real inflation-adjusted growth in ATS and ATSIG has been considerably slower than their actual dollar amounts. Both measures remain below their pre-recession levels, having increased by a total of 5.8% (ATS) and 7.8% (ATSIG) since the trough of the recession. Arkansas Taxable Sales (ATS) is calculated by the Institute for Economic Advancement to serve as a timely proxy for Arkansas retail sales. The series is derived from sales and use tax data, adjusting for the relative timing of tax collections and underlying sales, changes in tax laws, and seasonal patterns in the data. Arkansas Taxable Sales Including Gasoline (ATSIG) incorporates data on the state motor fuel tax and gasoline prices from the Oil Price Information Service. 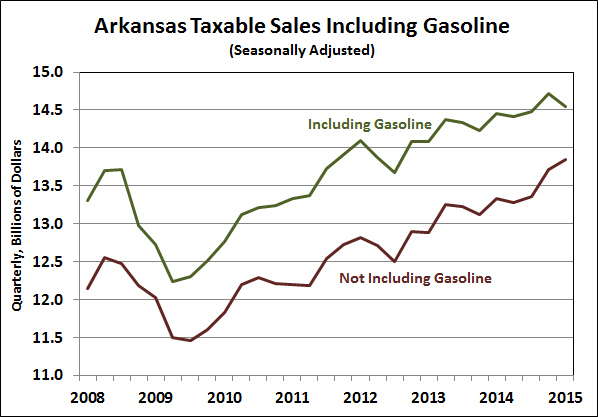 A spreadsheet of the data is available here: Arkansas Taxable Sales 2014:Q3 (Excel file). Newly compiled data on Arkansas Taxable Sales (ATS) suggests a slight slowdown in spending during the second quarter of 2014. After surging 1.3% in the first quarter, ATS fell 0.3% in the second quarter (seasonally adjusted). Compared to a year earlier, ATS was up only 0.2%. A broader measure — Arkansas Taxable Sales Including Gasoline (ATSIG) — was also down 0.3% for the quarter. In the five years since the trough of the recession (2009:Q2), ATS has increased 15.6% and ATSIG has increased by 17.8% — corresponding annual percentage growth rates of 2.9% and 3.3%, respectively. It is worth noting, however, that the taxable sales statistics are not adjusted for inflation. Using the price index for personal consumption expenditures, we can express ATS and ATSIG in real (inflation adjusted) terms. As shown in the figure below, real measures of ATS and ATSIG remain below their previous cyclical peaks. Since the recession trough, real ATS has increased by only 5.9% (a 1.1% annual rate), while real ATSIG has increased by 7.9% (a 1.5% annual rate). The Bureau of Economic Analysis launched a new data program yesterday, Personal Consumption Expenditures by State. The new data set only covers the period through 2012, but it provides a source of new information about consumer spending at the state level that was unavailable before. 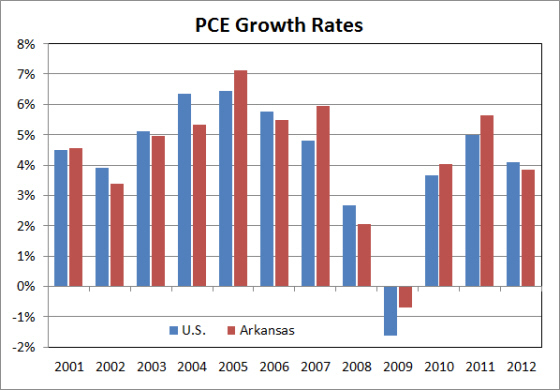 The chart below compares consumption growth rates for Arkansas and the U.S. The data are not adjusted for inflation, so the growth rates reflect changes in both prices and quantities. The data show that consumption spending in Arkansas slowed slightly more than the U.S. average during 2008 — the first year of the recession — but did not contract as sharply as U.S. consumption in 2009. In the subsequent 3 years consumption grew at an average rate of 4.5% in Arkansas compared to 4.2% for the U.S. In the most recent year available, 2012, consumption growth in Arkansas was 3.9%, slightly below the national average of 4.2%. However, that comparison partly reflects the fact that population growth in Arkansas has been running slightly below the national pace. In per capita terms, consumption growth in Arkansas was 3.5% in 2012, compared to 3.3% nationwide. The per capita level of consumer spending in Arkansas in 2012 was $28,366, the second-lowest in the nation and approximately 80% of the U.S. level of $35,498. This is a function of the relatively low level of income in Arkansas — consumption spending is ultimately constrained by disposable income. Among categories of expenditure, the BEA press release noted that Arkansas was among the lowest per capita spending rates for housing and utilities, as well as for food and beverages. 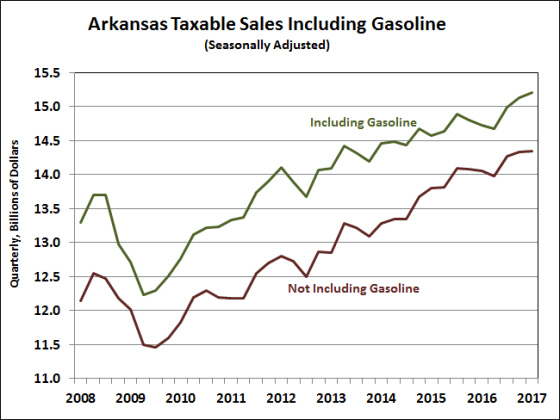 The measure of consumer spending that we have relied upon here at the Arkansas Economist up to now, Arkansas Taxable Sales Including Gasoline (ATSIG), showed a sharper decline during 2009 than the new PCE measure, and its recovery has not been as robust in subsequent years. ATSIG contracted by over 6% in 2009, and its growth averaged only 3.8% from 2010 through 2012. There are several differences between the two that might help account for the discrepancies. One difference ATSIG covers only items that are subject to sales tax. Since many services are not taxable, ATSIG underrepresent the importance of spending on services in a household budget. This doesn’t seem to help explain the difference between ATSIG and PCE, however. The data on PCE spending on services shows less variability than the goods component. Three other differences might help explain: First, Arkansas’ sales taxes apply not only to final consumption expenditures, but to many business-to-business transactions as well. To the extent that inter-firm transactions have been suppressed by the relatively slow economic recovery, some of the weakness in ATSIG might be separate from trends in consumer spending. The other two differences have to do with the location of spending. The taxable sales measure necessarily focuses on spending that takes place in Arkansas, whether it is from Arkansas residents or not, whereas PCE measures spending by Arkansan’s, whether or not the spending takes place in-state. A related issue is the proliferation of online shopping. Internet commerce is growing rapidly, and to the extent that many internet purchases by Arkansan’s are not taxed by the seller, the state often does not collect the tax revenue, nor is it recognized in ATSIG. 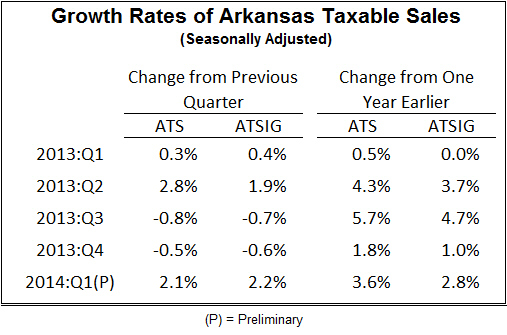 So it seems likely that the relatively slow growth rate of ATSIG is related to some combination of slow business-to-business spending, lower spending in Arkansas by nonresidents, and more spending by Arkansans to internet vendors and other out-of-state sellers. Preliminary data on Arkansas sales and use tax collection show that Arkansas Taxable Sales (ATS) increased by 2.1% in the first quarter of 2014 (seasonally adjusted). The first quarter increase follows two consecutive quarterly declines in the second half of 2013. 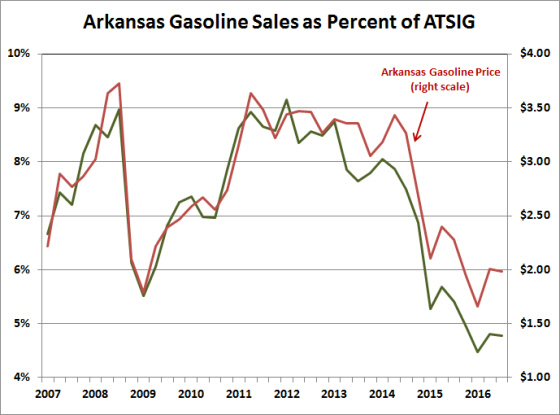 Incorporating information on gasoline prices and sales, a broader measure of sales — Arkansas Taxable Sales Including Gasoline (ATSIG) — increased by 2.2%. On a year over year basis, ATS was up 3.6% and ATSIG was up 2.8%. From the trough of the recession (2009:Q2) through the most recent quarter, ATS and ATSIG have expanded at average annual rates of 3.2% and 3.7%, respectively. * Data are preliminary until the release of the DFA report, Arkansas Fiscal Notes for April 2014, and will be updated when information becomes available.